While the deal is not quite official, the San Diego Padres and the Boston Red Sox have agreed in principle to a swap that would send 1B Adrian Gonzalez to Beantown in exchange for RHP Casey Kelly, 1B Anthony Rizzo, OF Reymond Fuentes and a PTBNL. Gonzalez, 28, will make just $6.2 million this upcoming season and is eligible for free agency after the 2011 campaign. Boston has a window that lasts until 2 p.m. Eastern Time Sunday to hammer out a contract extension with Gonzalez. The lefty slugger, who underwent right shoulder surgery in late October, must also pass a physical (CSNNE’s Sean McAdam Tweets that Gonzalez has already checked out medically). While trading an elite talent like Gonzalez is painful for Padres fans, the club did get three Top 10 prospects back in the deal. For now, though, let’s focus on how the trade affects Gonzalez’s value. A disciplined hitter with plus power, Gonzalez has managed to post sublime offensive stats despite taking cuts in a home ball park that’s death to all things lumber. Over the last three years, Gonzalez has batted .285/.387/.523, walking in 13.8% of his plate appearances and posting a .238 Isolated Power. To give you an idea of how much of an impediment PETCO Park has been to Gonzalez, let’s use one of Baseball-Reference’s many stat head goodies. B-R has a feature that allows us to adjust a hitter’s offensive production for run environment (runs/game), league (AL or NL), and park. Here are Gonzalez’s triple-slash numbers from 2008-2010. The first column has his actual AVG/OBP/SLG stats over those seasons. The second shows his stats in a neutral offensive environment in the NL. And the third shows what his slash line might have looked like had he been playing for Boston. B-R shows Fenway Park boosting overall offensive production by six percent. StatCorner has park factors by batter handedness, and the site has lefties getting a four percent bump. Homers aren’t easy to come by, but doubles are. By comparison, PETCO has a 91 Park Factor on Baseball-Reference (depressing offense by nine percent), and StatCorner shows the venue harming left-handed hitters 10 percent more than a neutral park. 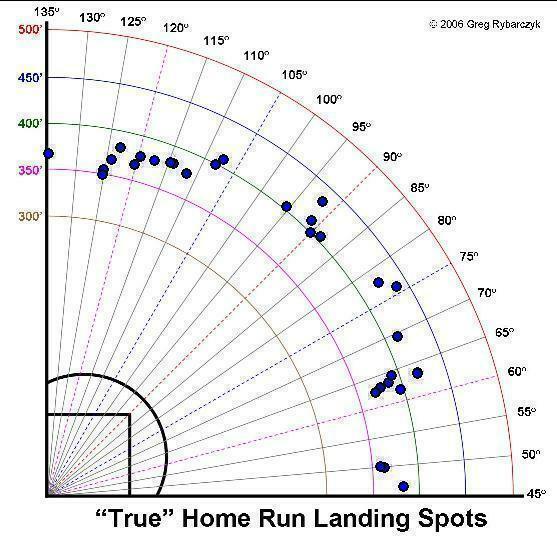 This past year, he hit 13 home runs to left field (41.9%), six to center (19.4%) and 12 to right field (38.7%). Over the course of his major league career, Gonzalez has hit 36.3% of his dingers to left, 23.2% to center and 40.5% to the pull field. Clearly, Gonzalez is an upper-echelon hitter. Getting out of PETCO’s clutches will only boost his fantasy value, which was already lofty to begin with. Over the past three years, Gonzalez has been part of an elite class of big league batters. His wOBA, adjusted for league and park factors, was 46% better than average (146 wRC+). Only Albert Pujols, Joey Votto, Kevin Youkilis, Miguel Cabrera, Matt Holliday, and Joe Mauer have better marks over that time frame, and Hanley Ramirez is tied with Gonzalez. Should the trade become official, Gonzalez becomes an even more coveted fantasy option. Also, with Gonzalez taking over at first base, Kevin Youkilis will shift across the diamond and get a bump in value by regaining third base eligibility. Gonzalez has been an offensive beast despite being shackled by PETCO. Now, we get to see what he’s capable of while swinging in a much more liberating Fenway Park. We hoped you liked reading Adrian Gonzalez to Boston by David Golebiewski! Good work here Dave. I’m guessing this projection also doesn’t account for the Fenway park off season bullpen improvements which will move the right field wall in 9 feet.